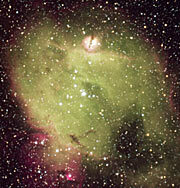 Optical telescopes collect light from the cosmos using a primary mirror. Bigger primary mirrors allow astronomers to capture more light, and so the evolution of the telescope has often followed a "bigger is better" mantra. In the past, mirrors over several metres in diameter had to be made extremely thick to prevent them from losing their shape as the telescope panned across the sky. Eventually such mirrors became prohibitively heavy and so a new way had to be found to ensure optical accuracy. A technology developed by ESO, known as active optics, preserves optimal image quality by pairing a flexible mirror with so-called actuators that actively adjust the mirror's shape during observations. Each of ESO's four Very Large Telescope (VLT) Unit Telescopes has a semi-flexible primary mirror with a diameter of 8.2 metres. When the telescope pivots to observe in a different direction, the shape and position of the giant mirror waver. Active optics corrects for these distortions by continuously monitoring a reference star during the observations, and a computerised image analyser detects even the smallest deviations from the optimum image quality. Based on the signals from this device, the shape and position of the telescope mirror are then automatically adjusted at regular intervals, typically about once per minute. 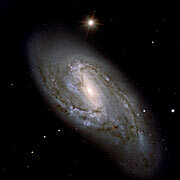 In this way, the stellar images always remain as round and sharp as possible. However, this does not correct for the turbulence in the atmosphere, which is done by a separate and faster adaptive optics system. 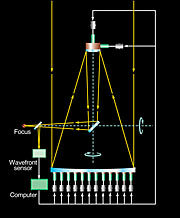 A computer-controlled active optics system was first developed at ESO in the 1980s. The first major telescope to benefit from this revolution in telescopic techniques was ESO's New Technology Telescope (NTT) at the La Silla Observatory. Since the NTT began operating in 1990, the 75 adjustable supports below its 3.58-metre primary mirror, coupled with advanced image analysis and control software, have made this telescope one of the best in the world. Active optics technology is now applied to all modern major telescopes, including ESO's VLT. Each of the four VLT Unit Telescopes is equipped with the best active optics systems constructed to date. The systems control the primary 8.2-metre Zerodur mirror as well as the secondary 1.1-metre lightweight beryllium mirror at the top of the telescope structure. This technology offers complete control of the optical quality, allowing the VLT to take full advantage of the exceptional atmospheric conditions at Paranal. The fine quality of the astronomical observations now routinely performed with the VLT confirms the success of this active optics system. Thanks to this technology, the primary mirrors of the four Unit Telescopes can weigh 22 tonnes, measure 8.2 m across and yet be only 17 cm thick — the shape of a giant pancake! Each of the mirrors rests on 150 computer-controlled supports that are installed in an exceedingly rigid cell that weighs about 11 tonnes. The VLT active optics system ensures that these large mirrors always have the optimal shape and will always deliver top-notch images of the Universe.